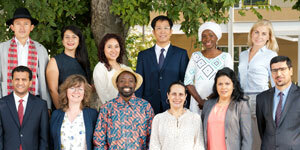 Come meet our Hubert H. Humphrey Fellows for 2018-19: 12 fellows from 12 countries who will spend the academic year at UC Davis developing professional skills and engaging with the community. During this welcome reception, the fellows will formally introduce themselves to the campus and community, share their backgrounds, and explain how they plan to spend their time at UC Davis to help their future work in the fields of natural resource management, agriculture and environmental science. Light refreshments will be served.